Cryptic notes on my first trip to Greece, with my Greek/American friend L. We visited Athens, an island in the Aegean Sea (nameless at the request of L.) and the Peloponnese peninsula. 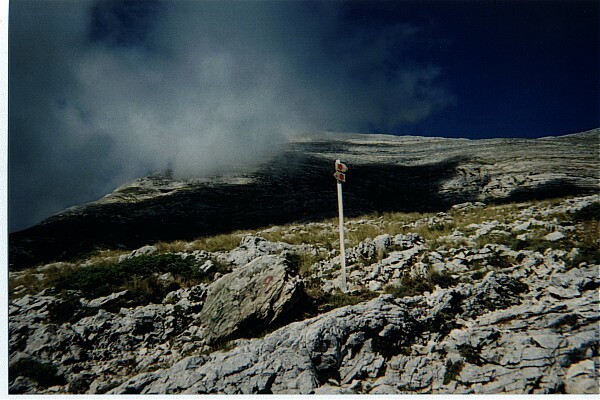 All photos were taken with a disposable 35mm camera. 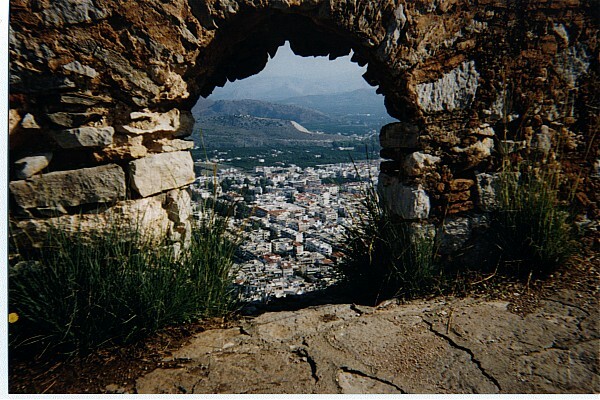 Appendices: Notes on Athens, Charming Malapropisms, Notes on food, Random cultural notes. Arrive Athens late afternoon. Horrible traffic - the taxi ride into town takes 2 hours. L. has nice apartment on top of a 5-floor building. Next day: 5-hour ferry to island. Observe Greek family w/ French girlfriend, spry old lady with backpack. Island: heavily terraced w/ stone walls, built of flat stones; thousands of miles. Building code: no aluminum windows; whitewash every Easter. Local village is quaint, with whitewashed houses and meandering cobblestone paths. Many jewelry, ceramic stores. Rent 50cc scooter (12 E/day). I have extremely good time driving scooter, plan cycle purchase in Berkeley. Extensive swimming off beach w/ calcifying sand, rocks near photogenic church. You can't take a bad picture of this church. Split peninsula: miracle of virgins rescued from randy pirates. Two nice restaurants on beach. Larger rocks near small village: giant chimney tempts me. I didn't go any higher. See old lady w/ backpack. Mysterious 'Chute de Nasdaq' signs. 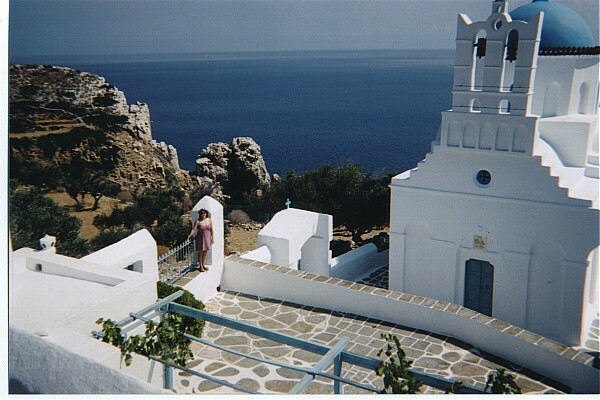 Hike to Prophet Elias church (high point of island). Greek coffee supplies at top. Entire population visits for yearly festival. Greek Orthodox church on top of every mountain, all called Prophet Elias. Ride scooter to church at rocky, barren northern point of island. Highly evocative of The Names by Don Delillo. 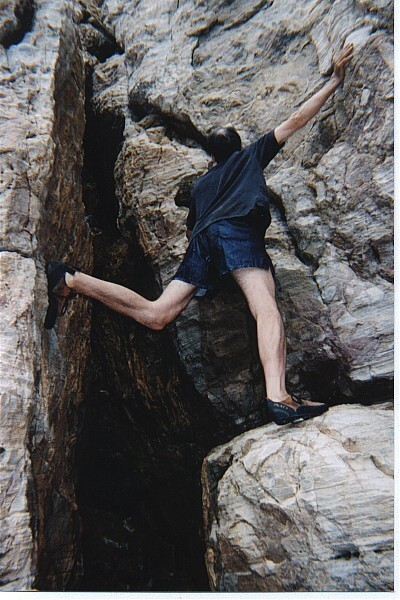 Rock climbing accident: I fall on bouldering move, lands on steep slope, tumbles another 6' or so. Bruised heel, back contusion, shin lacerations. L. deals with local tradespeople, trying to get floor repaired. We catch late-night high-speed ferry back to Athens, which has been afflicted by tropical late-afternoon thunderstorms in our absence. 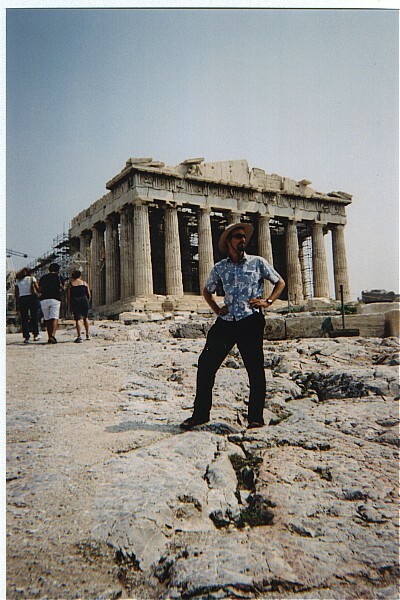 Next day we visit the Parthenon, the nearby Erectheion (source of much ribald humor) and the Tower of the Winds (likewise). 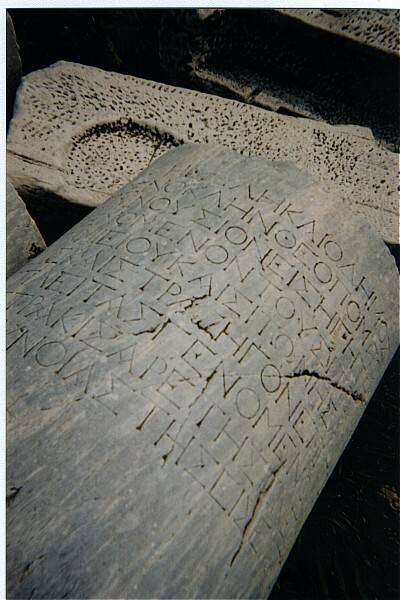 Some ancient Greek. Note lack of spaces between words. We descend through the Plaka (ancient car- and chariot-free neighborhood) and a modern Agora with dealers of many sorts of junk. Dinner w/ L.'s sister, laconic husband, and the mirthful Dimitri, who tells a series of jokes, the best of which draws a link between John Wayne and British toilet paper. Rent car (SEAT Ibiza - very good). Leave Athens ~11 AM. Aggressive driving is needed, so I seize control of the wheel. 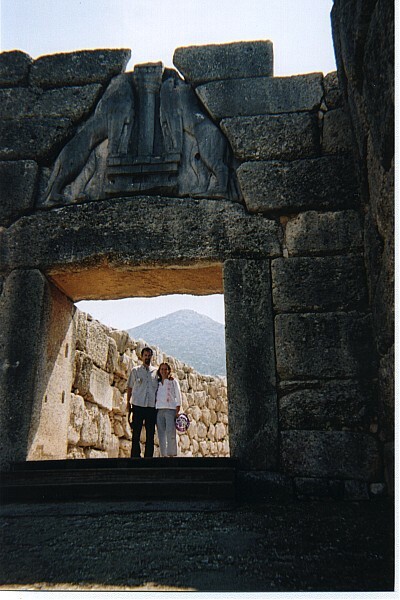 Visit ruins at Acrocorinth (Ancient Corinth - many towns in this area have Acro- and Neo- variants). I bushwhack to top; no access to highest tower. Teen girls with weight-loss psych book, Barbie, tend cafe. 14,000-seat ancient theater at Epidauros. German tour guide recites poem on stage; supposedly can hear from back row. Smattering of applause. Modern staging of Lysistrata w/ graffiti, old trucks. 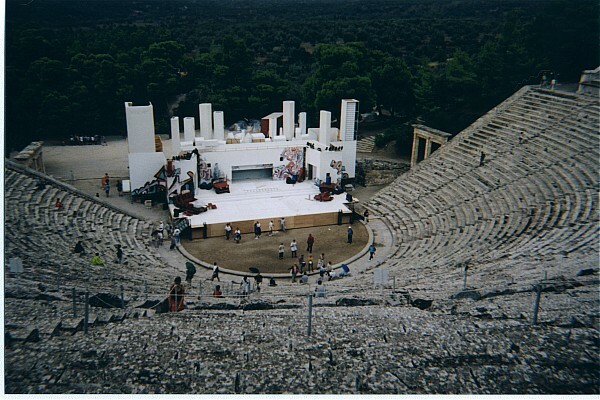 The theater at Epidauros. Note post-modern set. Giant thunder/rainstorm. Arrive Nafplion. Flooding in streets. Raw sewage smell. 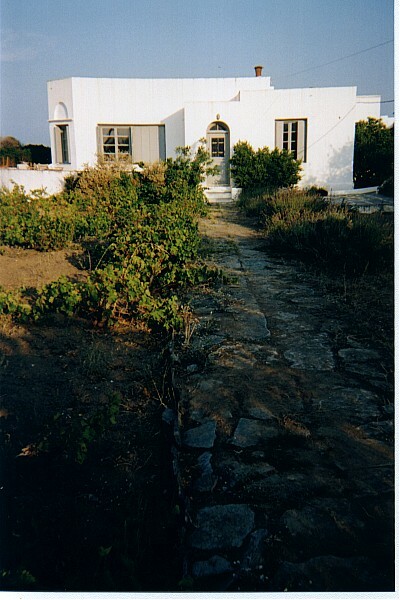 L. locates cheap hotel (Tyrins). Glossy central square. Worry-bead shops. Good restaurant near hotel. I buy gifts in tourist shop. Lots of Chairmans (Germans). Dead-looking dog in glossy square fails to spoil breakfast. 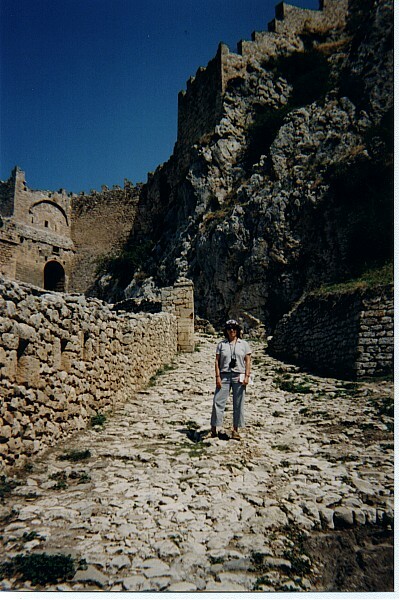 I climb to the non-ancient Palamidi castle (also possible off-trail). 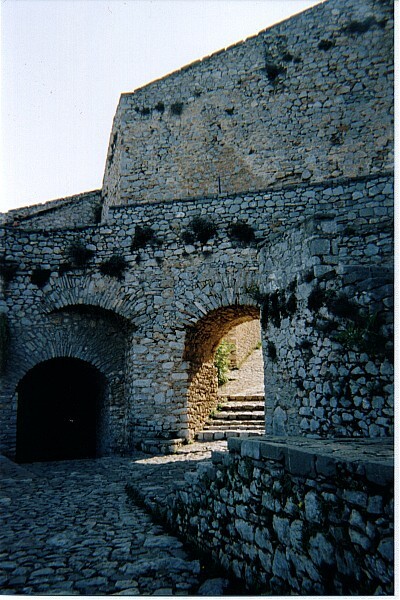 Palamidi castle. Nice colors, eh? Mysterious circular athletic field. 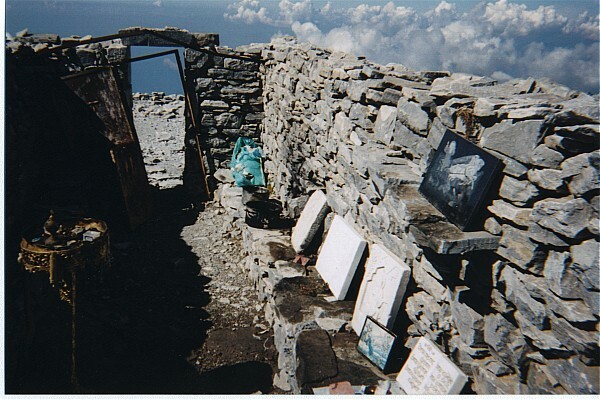 Tour ruins at Tyrins. Tour ruins at Mycene: secret cistern, tomb of Agamemnon. Many tour buses. Drive to Sparta. 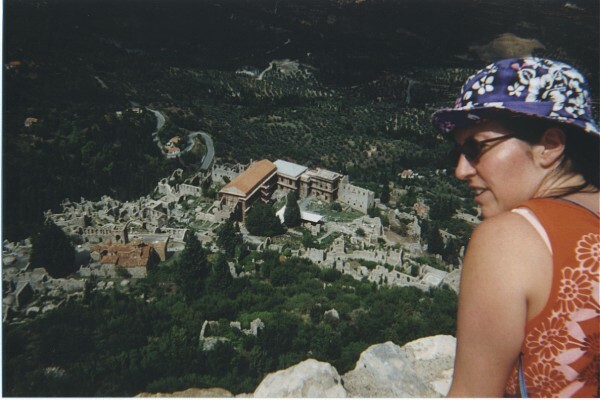 Drive to Mystras but too late to tour. (Western capital of Byzantine empire, once pop. 20,000). Crazed psycho w/ tractor wields chainsaw. Attempt to breach walls. Stay at Hotel Cecil. Gala inaugural showing of Spiderman at outdoor theater - free snacks and booze. Breakfast at 24-hour donut place. 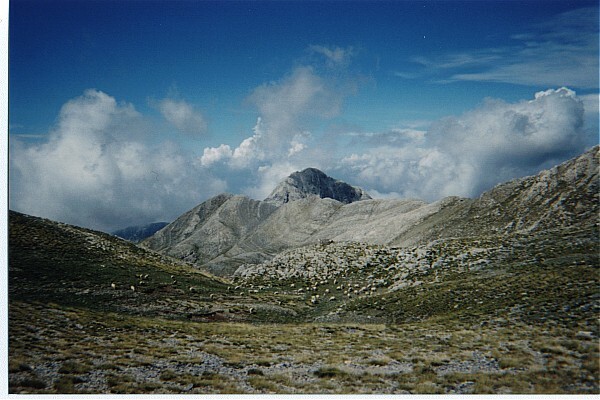 Drive to EOS (Greek mountaineering club) refuge. Several miles on dirt road, ~1 mile on smaller dirt road. 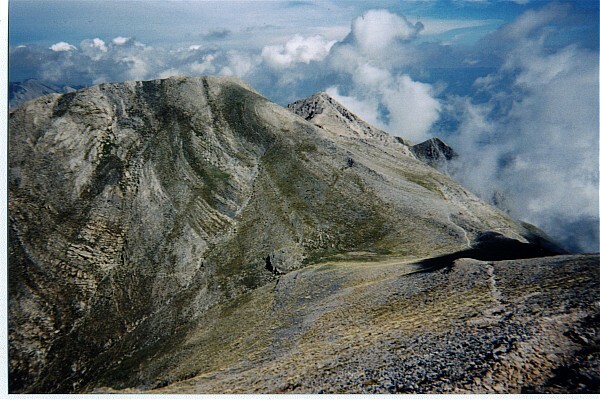 I climb Prophet Elias (1550m -> 2404m); leave 9:50, peak 11:20, start 11:35, back 1:00. Clouds arise, dramatic but no rain. The trail was extremely well marked. Cloud-shrouded summit. Gorges leading down to sea near Kardamili. Impossible to see, but flocks of sheep and goats are on far slope. Flock of sheep on descent. Meet German trio descending. Distant flocks of sheep and goats produce vast Gamelan sound. L. talks to ancient deaf/blind/lecherous shepherd. Nice Spartan caretaker at refuge offers coffee. 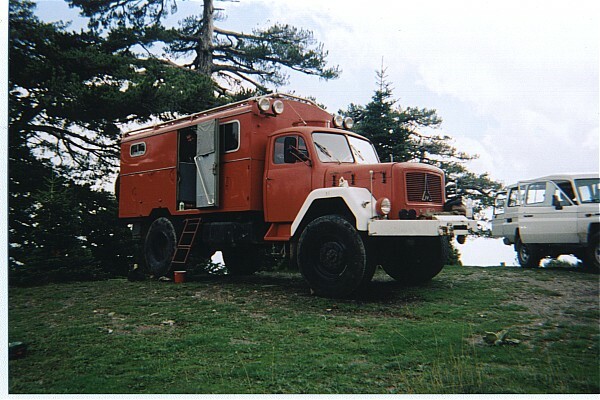 The Germans are touring in converted 1960's fire truck, drove from Berlin. Mileage: 100 Km per 20 liters. You do the math. Drive to Gytheion. Bad harbor restaurant with view of bread-feeding-frenzy fish. Annoying children w/ whistles. Completion of Maxwell's equations explanation. Boat tour of Diros caves; long (1200m water, 300m walking) and amazing. Whistle family reappears in same boat. Much Greek lewd banter, guide flirts w/ wives. Drive down to rocky beach with many Germans in campers. Shallow dropoff, nice swim. Stay in Areopolis (after Ares, god of war) in converted feudal tower. Chatty hostess, huge collection of firearms, putative note from Hitler about how Greece defeated him. Difficult stairway, short doorways produce welts on my head. Adjacent to cathedral (bad choice: festival day; bells). Restaurant with slow service angers me. Walk towards coast; distant lightning makes cloud light show. Woken up by extremely loud bells from tower 6 feet away. Poorly-intoned chanting from church service amplified on public speakers. Warm bread and Nutella for breakfast on balcony. Drive up into hills, attempt to locate trailhead of scenic gorge hike. Navigational problems, terrible 3-point turn. Rain starts to fall, give up on hike. Drive to Kalamata (charmless). Drive to Sparta via winding, extremely scenic road. Stop at sport climbing area (bring gear next time). Stop at Mystras. Frescoes in churches fail to live up to Gaugin/Monet hype. Rainstorm. Pleasant drive back. 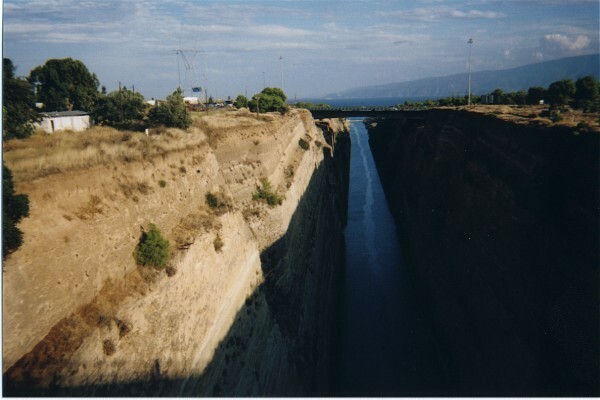 Stop at Corinth canal, which links the Aegean and Ionian seas and separates the Peloponnese - 6KM long and very deep. I toss in various coins. Visit archaeological museum in Athens. Artifacts from Mycene, Tyrins, many other places. Incredible bronze statues of boy on horse, Poseidon. Glass exhibit. Drive to suburbs to deliver Urs' rosemary gifts and make social calls. Deliver more rosemary, then visit a nice mountaineering store for info on climbing gyms. Museum of ethnic musical instruments is closed. More Plaka. With some effort, we locate a climbing gym on the fringe of town. It's the headquarters of EOS. Things are getting started when we arrive at 6:30, and a woman (Marina) tells us to warm up. The walls have partly wooden holds (positive, sloped). Routes are not well-marked, but good enough. We get harnesses and do all the top-rope routes. The man (Yannis) points out some 5.10-ish routes, and also a peculiar wood strip that snakes up the wall, for layback practice. The regulars do all lead climbing. We have a great time. L. subscribes to their bimonthly magazine. Dinner at a nearby Cretan Taberna leaves us both feeling bilious. Athens has grown explosively and haphazardly. It has a 2nd-world feel. Unlike most European cities, it has few relaxing places to walk. Small streets have no sidewalks, big streets are noisy and smelly, with motorcycles and scooters weaving among the cars. There are frantic efforts to upgrade the infrastructure in preparation for the 2004 Olympics. 'Fress Fiss' (Greek has no 'sh' sound). There are regional variations, but all restaurants have basically the same menu. In fact, most of them don't bother to print the menu. If you want, you can go into the kitchen and look at the prepared dishes. The variation between restaurants has more to do with freshness and quality of ingredients than with the dishes served. Olive oil and lemon season almost all dishes; salt is used liberally. Side dishes: boiled greens; 'gigantic beans'; 'fava' (like dal); tzatziki (garlic/cuke/yogurt paste); octopus salad (near sea). Main dishes: stuffed peppers and tomatoes; baked lamb or pork; baked chickpeas and onions (island). Lemon/chicken/rice soup. Eggplant in various forms. Baked artichoke hearts. Popular Cretan peasant dish: rusks (dry/hard bread) topped with grated tomato and sometimes cheese or olives. Wine aged in pine barrels, gives balsamic taste, served in metal carafes. Greek coffee: boiled, served w/ sludge. One sign said 'Made in the sand', which I at first took as a malapropism but which turns out to be an archaic and high-end way of preparing. Yogurt is available in a range of butterfat levels, from 0% up to 10%. Desserts: Baklava, other honey-based things. 'Honey dumplings' (platter of donuts drenched w/ honey, ice cream balls optional). Ice cream is available in some unique flavors, including yogurt which I enjoyed greatly. Ring-shaped cookies, semi-sweet like graham crackers. The culture is largely closed and conservative. MacDonalds and Starbucks have not made inroads here. ID cards specify religion. Even modern/liberal people practice religious customs. Baptism required for admission to public schools. Corruption exists at all levels. Major transactions (e.g. real estate) are in cash to avoid paying taxes. There are no personal checks. To get things done you need to know people; your connections are called your 'means'. Hatred of Turks is programmed at an early age. 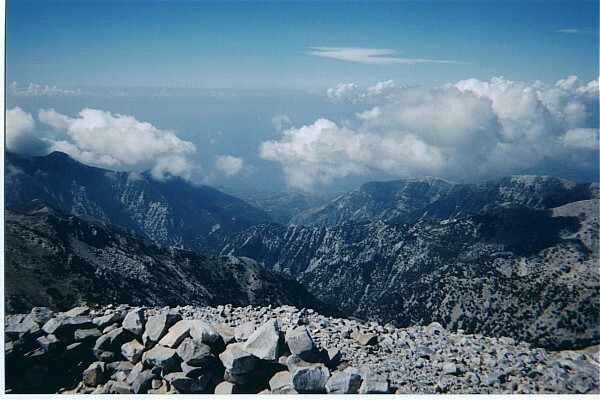 Mutterings of 'taking back what is ours' (the western coast of Turkey). Bizarrely, the seat of the Greek Orthodox church remains, isolated, in Constantinople (Istanbul). Normal conversation is loud and highly animated, and might be mistaken for fighting. There are different and specific salutations for thousands of situations. Nonverbal cues are different. The gesture for 'no' is raised eyebrows and a 'tsk' sound. The worst obscene gesture is an upraised open palm. There is a class of puns involving Greek phrases that sound the same as some English phrase ('Nice party' == 'There's Sparta' in Greek). There is a class of Jesus jokes told around Easter. E.g. : Jesus is on the cross, bleeding and near death. He moans piteously. Disciple: 'What is it, my Lord?' Jesus: 'Hey - I can see your house from up here! '.